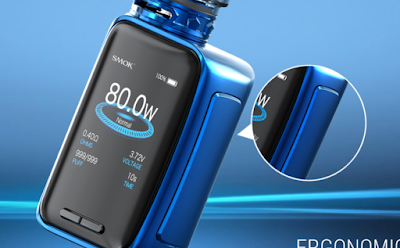 I know, when we talk about SMOK, you will be excited, right? SMOK is the most popular e-cigarette brand in recent years. SMOK has launched a variety of cool, high-performance Vape Kits. There will be some differences today. I am planning to share with you a portable Starter Kit from SMOK, the SMOK X-Priv Baby Kit. I think you must have guessed it, it is the Baby version of the X-Priv Kit. On this device, it has a 2.0-inch display like the X-Priv Kit, but with a more portable size. Compared with other 80W devices, SMOK has a 2300mAh internal battery for the X-Priv Kit, so we don't need to prepare a battery. As I said earlier, this is a device with 80W super output. Now you don't need to carry the heavy high power kit, you can get superb effect. TFV12 Big Baby Prince is a member of "Cloud Beast" and it didn't disappoint us. V8-Baby Q2 0.4 ohm dual coil, enough in the vapor production capacity to shock us. In the 40-80W output, you will find the output you enjoy. With the amazing airflow control system, you will be free to control the desired vapor temperature, and the amount of vapor. Yes, it all depends on you. 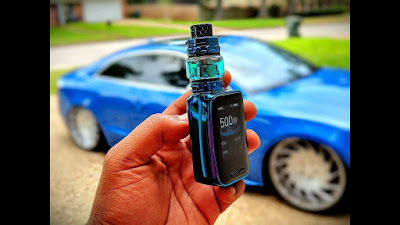 If you like this product, let's take a look at SMOK X-Priv Baby Kit reviews video.